Strong southerly winds, woomphing, and shooting cracks were observed on a tour up Green Butte. Many test slopes on the west side of the ridge were easy to trigger. 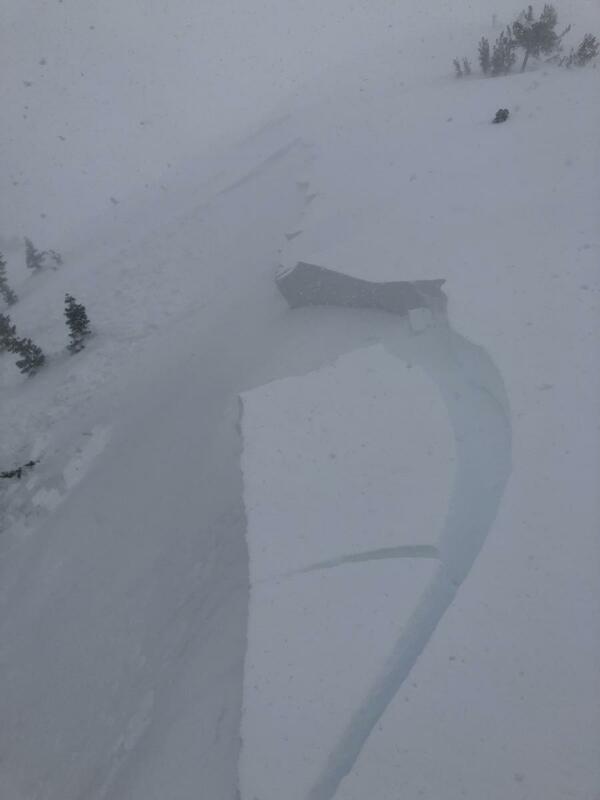 Instabilities were confined to the new snow old snow interface and failed on larger precipitation particles over hard melt-freeze crusts that formed this weekend. Drifts have formed on the ridgeline and in the trees. These drifts ranged in size from 6 inches to 2 feet and increased in depth with altitude. A test slope at 8,000 feet near treeline released and propagated approximately 100 feet along the ridge and running 60 feet down the slope, see video below. The crown was 6-16 inches deep. This slide ran on larger precipitation particles (1-2 mm) atop a 1 cm thick melt-freeze crust that formed this weekend. Column test performed near this slide showed very easy propagating results failing on isolation numerous times (CTV and ECTV). Surface textures varied with scoured hard snow, 1-2 foot drifts, and soft powder in protected pockets. 4 inches of new snow at Bunny Flat at 11 p.m.
A strong southern wind was actively blowing snow and swaying large trees around. It was constantly snowing at or over 1 inch per hour rate with brief periods of increased wind and falling snow at 2 inches per hour.